Der Chieftain/T95 ist ein britischer premium mittlerer Panzer der Stufe 8. Die Entwicklung des FV4201 Chieftain erlaubte die Austauschbarkeit der Geschütze mit dem amerikanischen Panzer T95 durch Austausch der Türme. Das Projekt wurde eingestellt, da es zahlreiche Probleme mit der Ausbildung der Besatzung hin zur Bedienung zweier Artilleriesysteme gab. 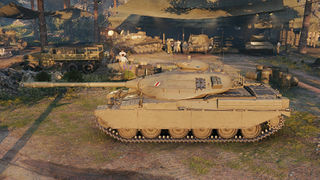 When developing the FV4201 Chieftain, it was proposed to make the armament interchangeable with the American T95 tank by implementing a turret from it on the Chieftain hull. The project did not continue due to the training requirements on the crew that would have to learn to operate two different gunnery systems. It was the reward for the "Operation Typhoon" campaign. 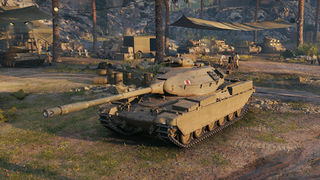 The tank was advertised as a premium, but when players received it, it didn't have premium credit multiplier. 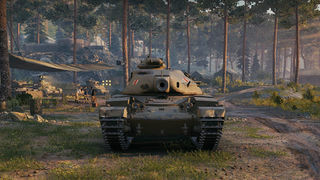 Wargaming will changed it in 9.15 to produce extra credits like any other premium tank. No research needed since it's a premium tank.